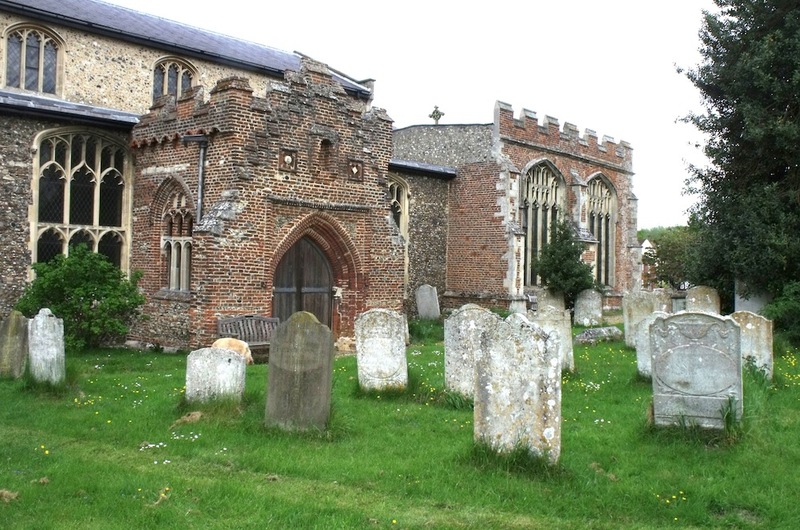 This beautiful church is at the heart of a large village straddling the Suffolk-Essex border in the Stour Valley. 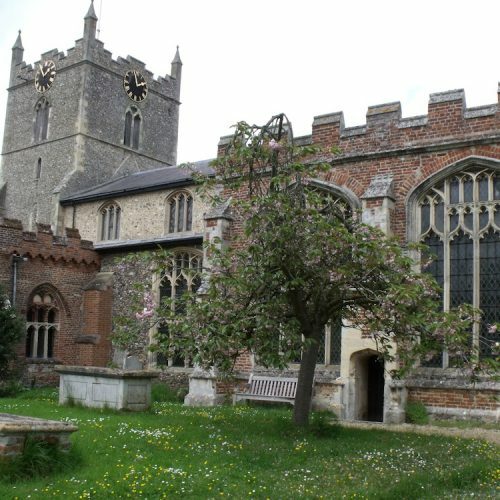 The exterior of the church with the Waldegrave chantry chapel and its impressive porches, two of the finest in Suffolk. Definitely worth a stroll round the building before you enter. 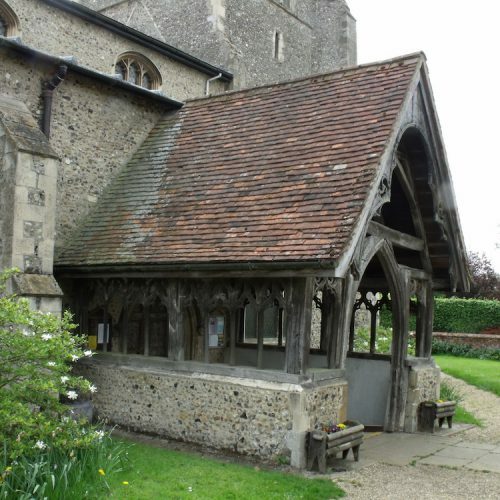 The Domesday book records a church with 18 acres of free land. Rebuilt in the 13th century when it was dedicated to All Saints and Our Lady (Nostre Dame), it became Seinte Marie (St Mary) in the 14th century when it was again largely rebuilt. 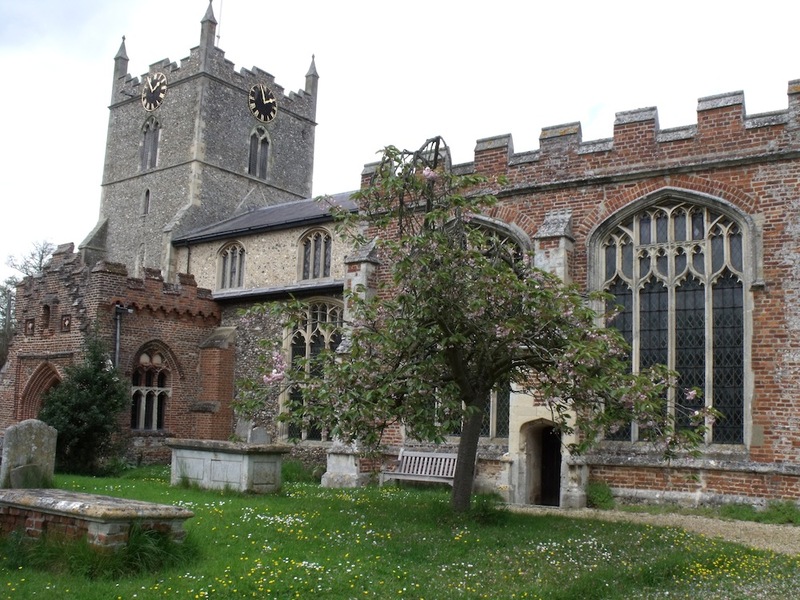 The tower dates back to 1410 and additions were made to the church in the 15th and 16th centuries. The tower was struck by lightning in 1733 which melted the bells! Today’s peal of eight is considered one of the finest in Suffolk. 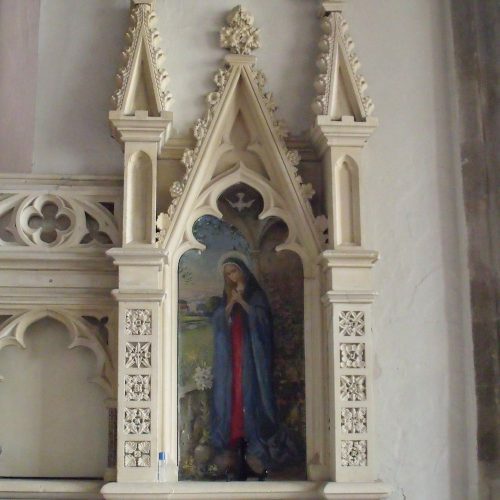 A major restoration in 1863 included the carved stone reredos. You can’t miss the Waldegrave Chapel at the east end of the south aisle, built by Sir William Waldegrave who died in 1527 and had 10 children, one of whom was Sir George Waldegrave, whose tomb is in the chapel and who died the same year as his father. 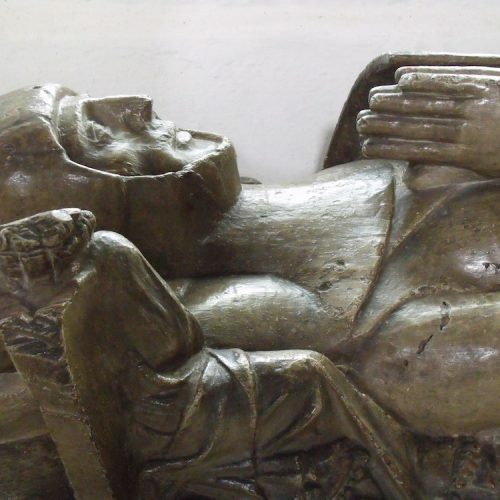 The tale of his son, Sir William, is full of Tudor intrigue and worth a look. 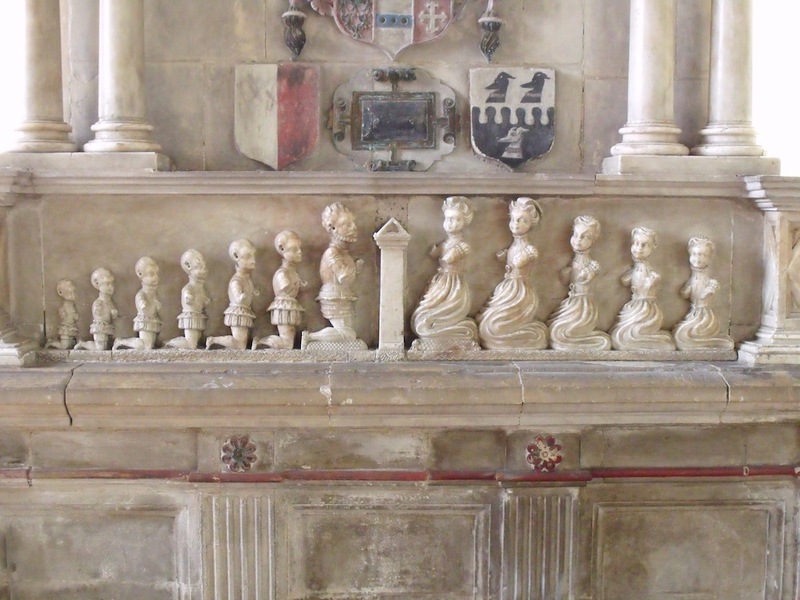 The latter’s own son, in turn, is commemorated on the monument in the Waldegrave chapel with his wife Elizabeth and their 10 children. You won’t avoid noticing that all their hands are missing – thought to be the work of Cromwell’s iconoclast William Dowsing. 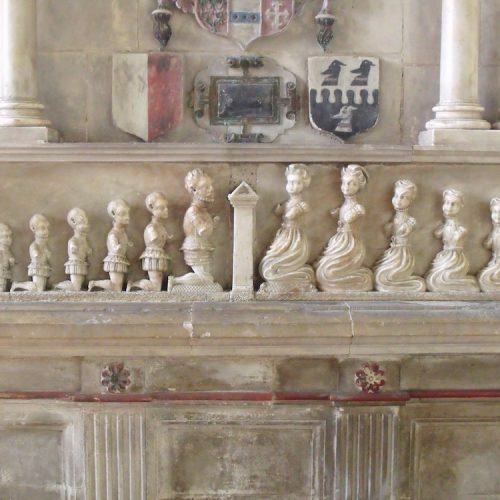 You can read about yet another Waldegrave tomb in the excellent guide book available in the church. Too many Waldegraves? This family tree might help. Those Waldegrave monuments. A shame the tomb of the founder Sir William has disappeared without trace. Sir George’s is the one stripped of its brasses. 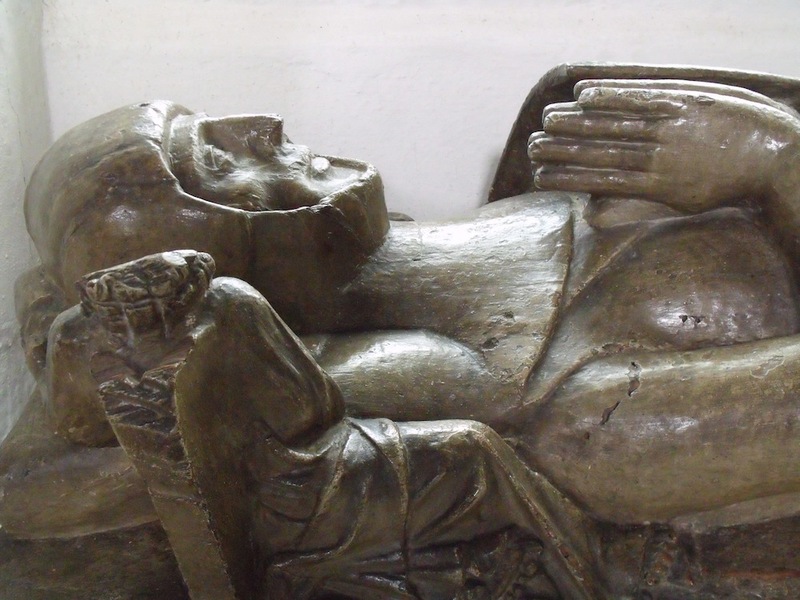 The rare, early 14th century effigy carved in sweet chestnut, one of only six wooden effigies in Suffolk, and thought to represent Sir Richard De Cornard. The 15th century font with its colourful arms of England, and those of important local families, including the Waldegraves! St Mary’s is open daily, year round. There’s a thriving choir of 18 people and occasionally concerts are held with various local choirs. There’s an ‘Open Door’ drop-in café on Wednesdays 10.30am-12 noon. Find out more about what happens at the church here. 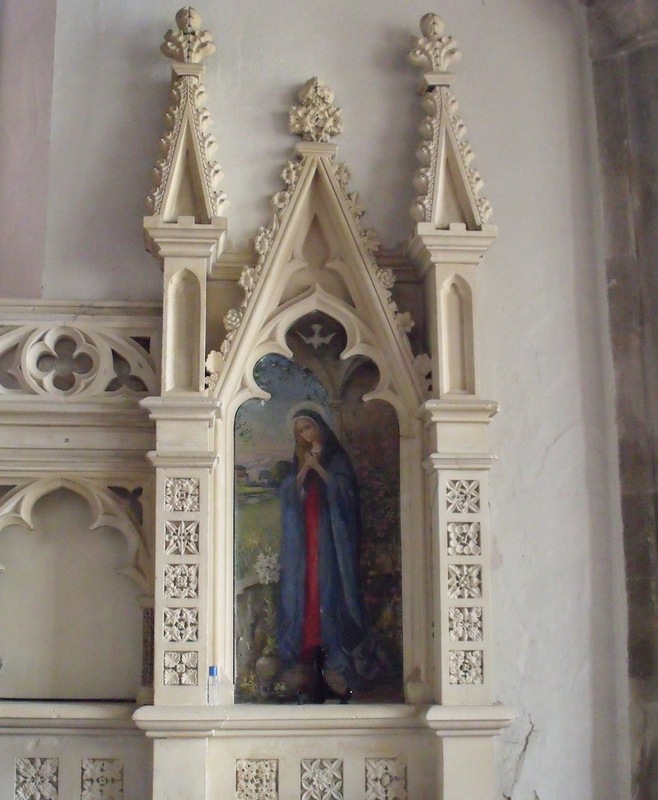 The painter John Constable’s ancestors farmed at Bures and in a vault below the Sanctuary lie the remains of Mary Constable, his aunt. A stone tablet on the wall records her death in 1792. You are in the heart of Constable Country and in the Dedham Vale Area of Outstanding Natural Beauty. 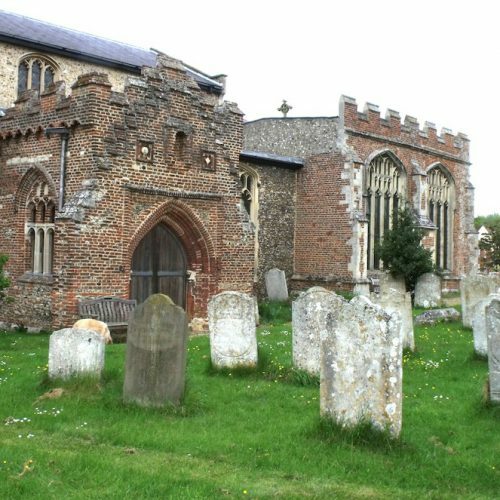 You can explore the countryside on the Dragon Country walk, taking in the medieval St Stephen’s Chapel where St Edmund was reputedly crowned king of East Anglia in AD855. Visit nearby nature reserves Arger Fen and Spouses Vale, owned and managed by the Suffolk Wildlife Trust. The annual Bures Music Festival raises thousands of pounds for local charities and is held every July. The branch line station is at Bures so you can arrive from Sudbury or Marks Tey. There’s also an hourly bus service by Chambers from Bury St Edmunds via Sudbury and through to Colchester. The Eight bells pub is on the Colchester road and the Three Horseshoes in the Nayland direction. There is also the Thatchers Arms, less than three miles away on the B1508 towards Mount Bures. 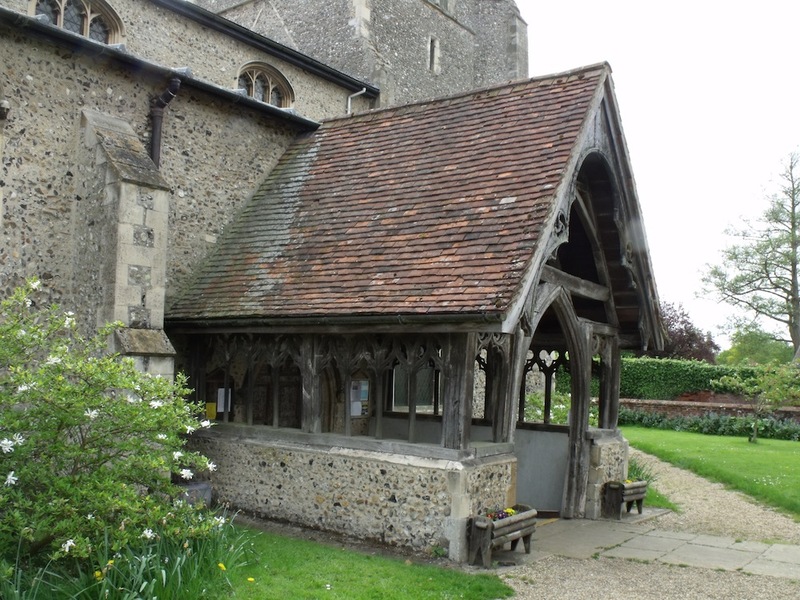 If you fancy a picnic in the churchyard, there’s the Bures Deli. The toilet is not currently accessible for wheelchair users.